CCTV camera records moment terrorist struck, wounding two people in Netanya market. A CCTV camera captured the chaotic moments an Arab terrorist went on a stabbing spree at Netanya market. 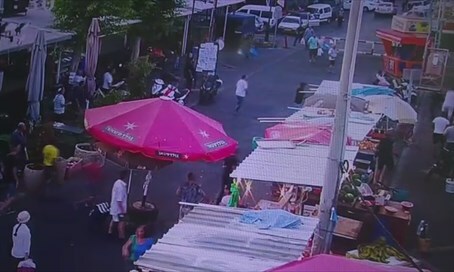 The footage shows pedestrians going about their daily business before suddenly, just off-camera, the terrorist strikes. After initially fleeing to safety, dozens of passersby then turn to face the terrorist, chasing him until he was finally shot dead by security forces. A 30-year-old woman was seriously wounded in the attack, and a man in his 40s was left moderately injured.